Disco music has been swallowed up and regurgitated by mainstream culture to a point that it’s now hard to understand why it was initially so hated. However, from its jazz-tinged origins in Nazi-occupied France, the discotheque lifestyle has always been one of cultural and political subversion where people from diverse walks of life could come together and exert themselves physically (take that as you will). In this episode of Goat Rodeo’s excellent Between The Liner Notes music documentary podcast, host Matthew Billy begins a two-part journey through the origins of this musical genre, aided by veterans of the vibrantly bespectacled trenches, like DJ Joey Carvello and RFC Records owner Ray Caviano. Even those without much interest in dance music or those with merely anthropological curiosity should find this to be a fascinating account. It could even recontextualize the overplayed songs enough to make them pulse with excitement again. Buffy The Vampire Slayer is a show that always managed to temper its inherent campiness with feminist overtones, and the hosts of the recap podcast Buffering The Vampire Slayer capture that balance perfectly. Musician Jenny Owen Youngs and Everyone Is Gay cofounder Kristin Russo, along with their weekly guests, break down episodes of the beloved Buffy—a series both hosts have rewatched multiple times—covering its ’90s fashion, the inaccuracies of the mysticism woven into its scripts, and its themes of femininity and sexuality, which range from problematic to praiseworthy. This week, cartoonist and die-hard Buffy fan Kate Leth joins Russo and Youngs to cover season two’s “Halloween,” in which the Scooby gang turns into real-life representations of their Halloween costumes. The podcast tosses in some short and sweet prerecorded jingles, literally singing the praises of characters like Cordelia and Drusilla. But the cherry atop this delightful series is each installment’s finale, when Youngs sings catchy original songs recapping the central theme of the episode. In Emil Amos’ Drifter’s Sympathy, the titular (and prolific) underground musician Emil Amos narrates the dark and arresting stories of growing up in the ’90s as an outsider trying to find his way. With co-host Jonah Bayer, music journalist and A.V. Club contributor, Amos tries to sort through this rich personal history dotted with bleakness and struggle. The episodes are produced in a sort of audio fiction style, as Amos displays an acute awareness of how the players in his life echo classic literary archetypes. It’s an unflinching account of a hero’s journey, tinged with the wisdom of hindsight. “Back To Boston” takes place when he was 17, after getting a guitar broken over his head. Amos tells us how he somewhat accidentally got into college and returned to Boston to live with his “guru” one last time, indulging in various drugs and narrowly escaping death on the freeway. The music underscoring the episode lends it even more artfulness, especially the use of Holy Sons’ “Trampled Down,” a song given new weight and new meaning when coupled with Amos’ stories. Vulture’s latest podcast offering, helmed by Senior Editor Jesse David Fox, provides a space for comedians to detail the creation of a single joke and how it factors into both their careers and overall senses of humor. In this episode, Chappelle’s Show co-creator Neal Brennan joins Fox to discuss a toss-off joke in Half Baked, the stoner comedy he co-wrote with Chappelle, wherein a black woman calls Harland Williams’ character the N-word after she mistakenly thinks he made a fat joke. It’s a stupid bit, but one that invites a fascinating discussion of Brennan’s talent for writing comedy for black actors as a white man, as well as his thorny penchant for using the N-word, which he here defends within the context of his personal philosophy and upbringing. He touches on his writing process with Chappelle, both in their earlier work and on Chapelle’s recent Saturday Night Live hosting gig, and he shares the growing pains he experienced moving into stand-up after getting his start as a comedy writer. Brennan, by his own admission, tends to rub people the wrong way, but this conversation goes a long way toward understanding what some might consider a problematic comedic presence. 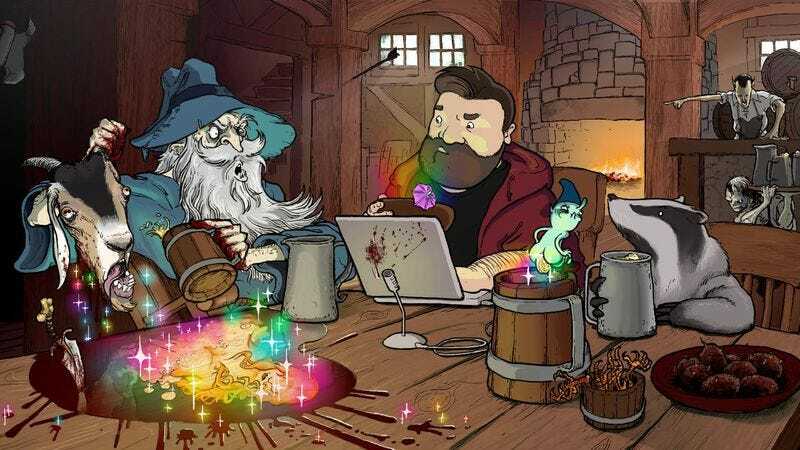 In this special 100th episode, the Magic Tavern crew is finally ready to embark on its quest to defeat the Dark Lord, a journey it’s discussed ever since Arnie first arrived. First, the hosts must gather the fellowship: Pimbly Nimblebottom the gem-pooping imp, Germ Crust the dual makeup artist/ghost handler, and Tannakin The Pinglet, a tiny flying pig who is not the least bit evil or suspicious. After running through punny nicknames for the quest, they’re interrupted by Squibbert and Baron Ragoon, affiliates of the Dark Lord himself. Baron is characteristically polite even in his threats, and a conversation with Squibbert reveals dark secrets about a certain member of the fellowship. The chatter finally culminates in action when a hatch is opened to the basement, and a dramatic battle ensues involving birds, an unwed mother, Pizza Skull, a heartfelt moment between best friends, and the greatest force of evil Arnie, Chunt, and Usidore have ever had to face. It’s a landmark episode in more ways than one, and the show has never been more confident than as it lays this groundwork for a new chapter of hilarious podcasting, adding unprecedented depth to its magical world. For the past week, it’s been ever so remotely possible to stick a pin in political debates and argue instead about whether or not one’s preference of La La Land over Moonlight makes them fascist. Now that the Oscars have passed us by, we needn’t go back to discussing things that actually matter; instead, we can spend another few news cycles basking in the post-awards chatter about who wore whom and what was said to which people at which parties. For a better feel for what it’s like inside one of those parties, Thursday’s episode of Little Gold Men is quite handy. For the entire week leading up to the Oscars, Vanity Fair’s Katey Rich, Mike Hogan, and Richard Lawson hosted daily episodes focusing on specific aspects of Hollywood’s biggest night, and this particular installment is perhaps the most memorable. Julie Miller—co-host of the In The Limelight podcast—joins them to discuss the surreal glory of the annual Vanity Fair after-party, where one might witness Benedict Cumberbatch scarfing down cheeseburgers with Joan and Jackie Collins, and where even the biggest stars crane their necks to get a better look when Beyoncé makes her entrance. Thirty-three-year-old Donald Taylor was in a relatively good place in life when he vanished in January 2016. He had overcome a meth addiction and was closing in on a year of sobriety while also managing the schizophrenia he had endured his entire adult life, and he even had a romantic interest. But at 2 a.m. on January 3, a shoeless Taylor walked down a street in McKinney, Texas, and out of the lives of everyone around him. At least, that’s according to the person believed to have seen him last: his sister, Shirley. His other sister, Sandra, however, questions Shirley’s version of events, and in an emotional interview with host Jordan Sims, Sandra accuses Shirley of knowing more than she’s telling. Sandra reveals what she believes is an alternate version of the events that night, and goes so far as to explain how or why Shirley would have covered up the real story. Taylor remains missing, but Thin Air reveals that the police might have additional leads as to his whereabouts.